Proper Fuel = Optimal Performance! 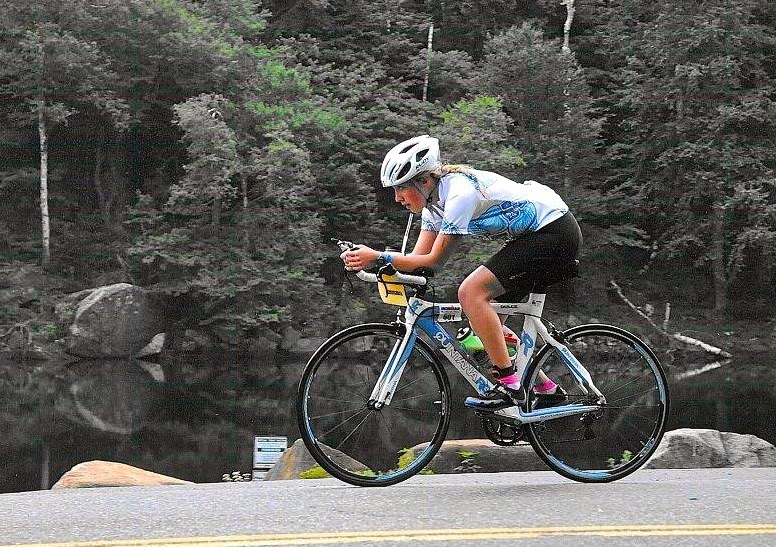 The following is a post by YoungTri Ambassador Hannah Feinberg on the proper training diet and race fuel. Let me start by asking you a question: If you drove a Ferrari, what kind of gas would you use to fuel it? It’s a no-brainer… you would only use premium for your luxury car. Now, think of your body as a Ferrari. For optimal performance, your body requires “premium gasoline”. The “premium gasoline” for your body is the foods high in nutrient density and low in energy density such as fresh fruits and vegetables, lean meats, and foods low in fat. As triathletes, we need to be very conscientious about the foods we use to fuel our bodies. Your training diet is just as important as your exercise and mental plans because your physical activity, athletic performance, and recovery from exercise are enhanced by optimal nutrition. To achieve this, balance your nutrient intake, consume a wide variety of nutritious foods, eat moderately, exercise regularly, consume alcohol in moderation, and do not smoke. There are 4 critical periods of nutrition for an athlete: Day-to-day nutrition, pre-event nutrition, during- event nutrition, and post- event nutrition. The primary goal of your day- to- day nutrition is to achieve and maintain an appropriate body weight and fat level by balancing your Total Daily Energy Expenditure (energy expended at rest, energy expended from the digestion of food, and energy expended from exercise) and your Total Daily Energy Intake (consumption of calories). When your body expends more than you are consuming, it can lead to a loss of muscle mass, bone density and increase your risk of injury and illness. Some easy numbers to think about daily are: Consume about 2 liters of water, Consume 16-24 ounces of water per pound of body weight lost during exercise, Carbohydrate intake should be 6-10g/kg of body weight, Protein intake should be 1.2-1.7 g/kg of body weight, and your fat intake should be 20-35% of your total daily calories consumed. Your pre-event diet is the meal you eat the morning before a race or big training day. The main goal of this is to prepare adequate glycogen fuel stores in your muscles and liver, prevent dehydration, and avoid gastrointestinal distress. Meals should be consumed 3-4 hours before competition. They should be low in fat and fiber, modest in protein, and high in carbohydrate. You need to be sure you’re providing your body with sufficient energy so that you are not “playing hungry” on the starting line. My favorite pre- race meal is oatmeal with fruit, a piece of toast with peanut butter, and some diluted orange juice. 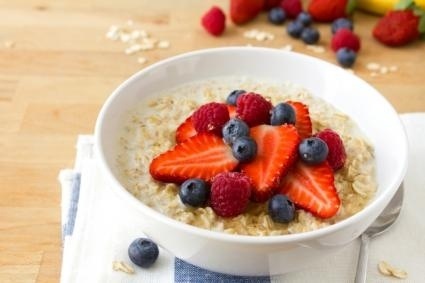 oatmeal is a great choice for a pre race meal! The primary goal of eating and drinking during an event is to restore depleted glycogen levels in your muscles and liver and prevent dehydration. In general, no carbohydrate is required for exercise lasting less than 30 minutes. For exercise lasting 30-60 minutes only a very small amount is necessary (the occasional sip). For 1-2 hours of exercise, up to 30g of carbohydrate per hour is necessary. Up to 60g per hour of carbohydrate should be consumed during exercise lasting 2-3 hours. The main source here should be glucose and maltodextrine. For exercise lasting longer than 3 hours, you should consume up to 90g of carbohydrate per hour from multiple forms. Your body doesn’t want glucose coming from the same source of carbohydrate every time. If you use different form of carbohydrate, they get digested at different times and are fueled by the body for different uses. If we look at a Gu, there are an assortment of ingredients but the primary ones are maltodextrine and fructose because those are monosaccharides and are already in forms that require the least amount of energy to be digested and can be utilized by the body the quickest. If Gus or Gatorade upset your stomach, check out my post from a couple weeks ago about “The Feed Zone Portables” for easily digestible food for endurance athletes. 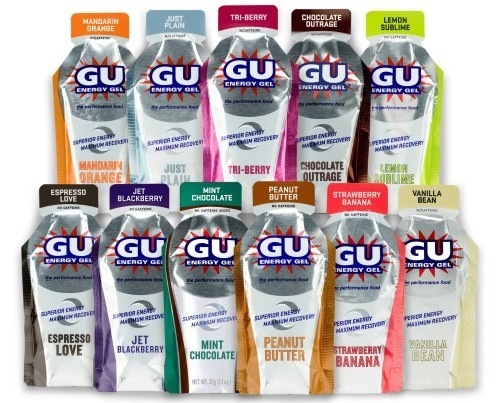 For shorter races (Olympics) I usually drink a diluted Gatorade on the bike with 1 Gu. For the longer races (Half Ironman and Ironman) consuming diluted Gatorade, Perpetuem, and Gu holds me over for the whole day. We are all familiar with the terms “bonking” or “hitting the wall”- where an athlete feels like they can’t push on any further. This occurs when your body runs out of carbohydrate stores; unfortunately, when this happens, there isn’t much you can do. So stay on top of your carbohydrate consumption during your workouts! The post-competition meal is probably the most important. You should eat within 30 minutes of finishing your event, and again every 2 hours for the next 4-6 hours. The goal here is to replenish the muscles essential amino acids by eating complete proteins, replenish your muscle glycogen, rehydrate to restore your body’s water balance, and replace electrolytes lost in sweating. Some good post event foods are: 1 cup of cottage cheese + 2 cups of fruit; 1 cup of juice, 1 slice whole wheat bread, 2 tablespoons of peanut butter; 1 cup of non-fat yogurt, ½ cup grape nuts and 2 tablespoons of raisins; 1 banana, 1 bagel, 2 tablespoons of peanut butter. As endurance athletes, we are all familiar with carbo-loading. The goal here is to maximize the glycogen storage for better endurance and delayed fatigue. Many people believe that the night before a race you need to gorge yourself on pasta, bread, more pasta, and whatever other sources of carbohydrates you can get your hands on. Overeating the night before a race is a very bad idea. Your body can only store 1280 calories of carbohydrates in its muscles and liver. When you consume more than this amount, it will be converted to fat, you will feel bloated and sluggish, and experience gastrointestinal distress. With this said, you should NEVER experiment with a change in diet during a race. Play around with your diet during training. Every athlete is different, so figure out what works best for you!